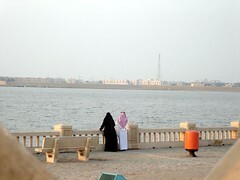 Took some photos during my trip to Jeddah, and decided to share some of them with you. Enjoy. I would like to ask for some assistance. I was born in the US but my father is from Saudi, he met my mother in college when he was an exchange student at Clark College in Washington state. He also went to UCLA. I was born in january 1966. My mother did not want to go to Arabia so she stayed here and my parents broke up. My son is now 8 and we would like to find him. his name is Abdul Al-omran. Please contact me at persiangirl1@yahoo.com if you have any advice for me. why would you want to find him? He may choose to keept your child in Ssudi, if you chose to go there. I’ve lived in K.S.A..spending a major part of my childhood and teen years there..its not a wierd place to start with, as others might think…Infact, its a place that enriches you with the Arabian culture, gives you a feel of the the incense,the abhayas, the gold markets etc.etc. Life in Saudi Arabia does have its limitations but hey! which country doesn’t. One thing I like about the place is its monarchial rule..Its such a relief to live in a place that does not have the shouts & screams of politicians landing in the air every now and then…the malls are beyond description..the Faisaliya Tower just takes your breath away! So guys, face it, its not just another Islamic kingdom!! Trust me! hmmm…saudi arabia helps u keep in touch with the rythms of the middle east. I hope to live in Saudi Arabai because it is big country and have many rules. well mr i like ur topic and its un important supject in our lifes these days ..